Jed Duvall as Paul McCartney, Johnny Cash and Elvis! Jed Duvall and Speed of Sound-Live! Jed Duvall is an award-winning tribute artist, whose recreations of music icons is, in the words of one fan, "So uncanny, it's almost spooky!" 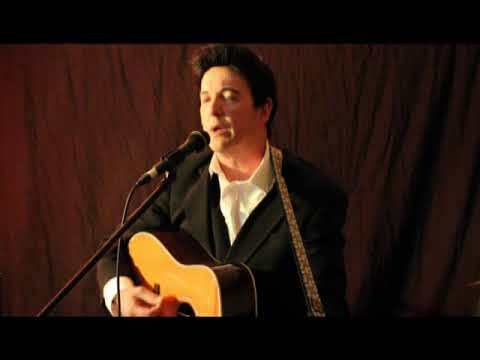 Whether it's portraying Elvis, Johnny Cash, or Paul McCartney, Jed is sure to add that edge to your event! Available as a solo act, or with a full band! 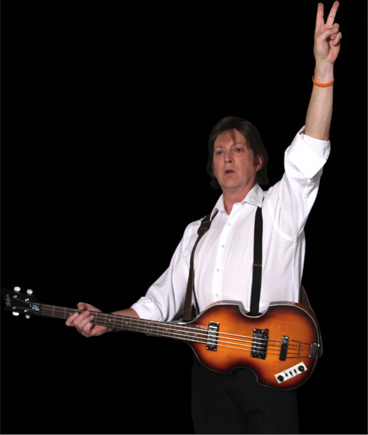 In addition, Jed also performs with Gene "John Lennon" Feldman as "Two of Us; The Lennon/McCartney Tribute". Together they perform as an acoustic duo, playing songs from the greatest songwriting duo of all time! Imagine, having John and Paul at your next event! All I can say is Wow! Jed was very professional and personable! My cousin has cerebral palsy and is non-verbal. Jed really engaged with him and made his 55th birthday so memorable and special! We will definitely book again. Mr. Duvall was a hit at our party! His Johnny Cash impersonation is right on! Very highly recommend at any event! What a great performance and a fanstaic night! Jed Duvall's tribute to Paul McCartney was spot on and sounded so great! Put everyone at our fundraising event in a good mood for donations and a fun time! Highly recommended and would definitely hire Ja highly recommended and would definitely hire Jed and his band again! If you need a real entertainer who can WOW and seduce the crowd, Jed Duvall is your man! He is a real talent, and a really nice guy! He socialized and worked the crowd before his unbelievable performance! And, then, he literally knocked our 370 guests off their feet with his terrific vocals! If you need someone to impersonate Elvis, Jed is the right person for you! If you need an all-around brilliant entertainer, Jed is the right person for you! We will definitely engage him again, and we're happy to provide an outstanding referral and reference! Jed is a true professional. He not only is spot on impersonator, but a gentleman and delight to work with. Everyone loved him at our gala. I would highly recommend him! Jed is a pro. Everyone loved the show. He arrived on time and stayed after for photos. Show was a big hit. Would highly recommend! HAPPY,FUN NIGHT !!!! Jed ROCKS !!!!! Jed and the Band are full service, and have all equipment necessary for a full show (including lights, PA system, etc.) The band plays up to three hours with two 20 minute breaks. The set list varies according to the needs of the client. Requests for specific songs are usually no problem, as long as they are presented to the act so that the band can master unfamiliar selections. Past clients (especially those on a corporate level) have provided risers or a stage of some sort, and a minimum of 250-300 square feet (about 16' x 8') is a requirement for the amount of equipment used in an average performance. Jed also performs as a solo act, with professional backing tracks, and provides a full system or a smaller portable sound system, depending upon the needs of the client. 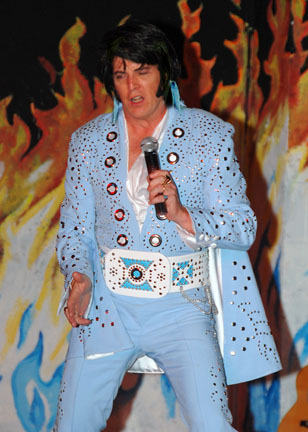 Jed Duvall is an award-winning tribute artist/impersonator with over thirty years of on-stage experience. He has performed in small local nightclubs and large concert venues, and his recreation of music legends is uncanny. But who is he, and how did he get into this? Jed was born in Washington, DC, but was actually raised in the small tobacco farming community of Croom, Maryland. Living in such an isolated area, he relied upon his imagination for entertainment, often playing a tennis racquet and pretending he was one of the popular singing stars of the late sixties and early seventies (often, this was Paul McCartney). In school, Jed participated in many local dramatic productions, as well as sung in his church choir. It was no surprise that at an early age, his goal was to become an entertainer, either acting in Hollywood or touring with a band. But his aspirations were altered in 1978, when high school was treated to a performance by a local Elvis tribute artist. "He was so commanding onstage, and made such an impression on the audience—especially the girls—I decided I wanted to do that, as well". Two years later, he entered his high school talent show as "Elvin Preston"—and bombed. "I think they had twelve contestants, and I came in 11th place", he laughs. "And the judges were pretty merciless". But undaunted, he continued to impersonate the King of Rock and Roll, even after joining the Army in 1980. And in the spring of 1981, he entered a contest held on post—again, as "Elvin Preston"—and won. After his discharge in 1983, Jed auditioned for the American Academy of Dramatic Arts in New York, and was accepted for their two year program. "What I learned there—movement and dance, vocal production, acting techniques, and even makeup—would be valuable lessons I use to this day". 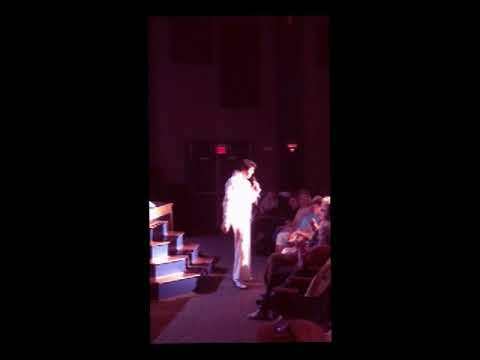 But even as he attended classes during the day and worked nights, he continued his tribute to Elvis, winning a major contest in New York City, and invited to portray young Elvis in "Elvis; An American Trilogy", a production that ran in various venues during the mid-1980's. Jed also sang in various bands, including the Hell Hounds and the Brothers of Doom (in which he was known as "James Doom"). But as the years went by, Jed longed for security and a family. He went back to college and graduated with a bachelor's degree in Digital and Imaging Arts from the University of Maryland in 1996. And that same year, he married his wife Kim, and helped to raise Kristi and Josh, Kim's children from a previous marriage. Skip to 2005. By this time, Jed had been working as a digital imager for nearly ten years, but the itch to perform persisted. 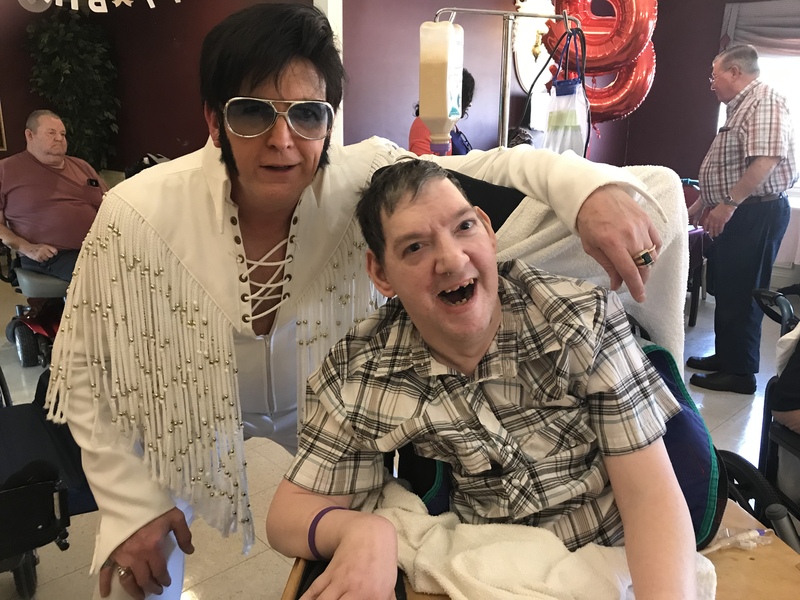 He began doing community theater in the Baltimore area a few years before, and in May, 2005, entered his first Elvis contest in a decade. 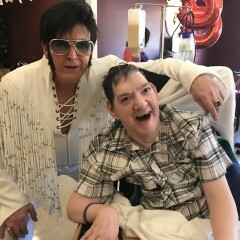 Seeing the amount of Elvis tribute artists already established, Jed was more than willing to try his hand at other personas. 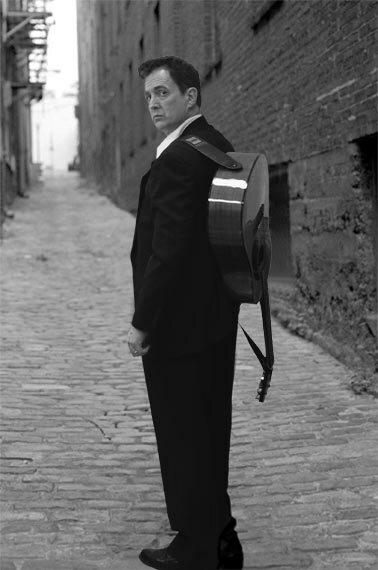 In 2007, he started his tribute to Johnny Cash, and together with his Elvis act, found himself performing more than ever. But there seemed to be a recurring theme—"No matter if I was performing as Elvis or Johnny, people would approach me after the show and say, 'Do you know you look like Paul McCartney?'". And after attending a McCartney concert in 2009, the energy and excitement—as well as those familiar tunes Jed sung while working on the farm so many years before—were more than enough to persuade him to add Paul to his lineup, each year adding more appearances as Sir Paul than ever before. Today, Jed continues to be a sought-after tribute artist, and his performances have taken him all over the country. But he enjoys the home he shares with Kim in a small town outside of Baltimore. And if you drive by and he's on his lawn tractor, you can still hear him singing the tunes of his youth. Sgt. Peppers/The End...and many more. I Walk the Line...and many more. As with any "tribute act", the entertainers being represented are the major influence. By studying concert footage, interviews, and rare movies, reading biographies and auto-biographies, and listening to the music (as well as those acts that influenced Cash, Presley and McCartney), Jed is able to recreate these artist with expertise.